The centre of a web of trade that stretched around the globe, of an empire that touched the shores of every continent before it was lost and then rebuilt, late eighteenth-century London is the moment and place where the modern world was born. By 1815 London was without question the largest city in the world, with perhaps the world's most diverse population. It encompassed the slums that dominated its eastern reaches and the obscene wealth of its aristocratic West End. It gave home to the beggar, the trader, and the baronet. Detailed in the Proceedings can be found the money and the poverty, the greed and the generosity, the humanity and the cruelty that exists in any great city, and in this city perhaps more than any other. From perhaps 750,000 souls in 1760, London grew decade by decade to reach 1.4 million individuals by 1815. Built by hand, a city still dependent on night-soil men and hand pumped water; London developed a complex organisation in these decades to feed and water, clean and care for an unprecedented number of people. It was in these decades that London’s pattern of inexorable growth became more firmly established. And this growth was largely the result of migration. High mortality rates and unhealthy living conditions continued to suppress the fertility and life expectancy of native Londoners, ensuring that the capacious shoes of the dead always needed filling with new feet. At the same time, with the introduction of innoculation against smallpox and a decline in infant mortality London's population started to become sufficiently healthy to reproduce itself. What was most distinctive about this period, however, was the pattern of migration. People from Europe and the British Isles now rubbed shoulders with Black Africans and Caribbeans; with Lascars from India and returned colonists from North America and later Australia. 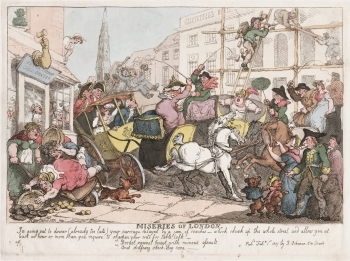 Thrown onto London’s shores by the storms of war and revolution, of the Seven Years’ War, the American War, the French Revolution and the Napoleonic Wars; these new, war-weary migrants created a population for late eighteenth-century London that was more varied than had existed in any European city since the Roman Empire. Evidence of all these communities can be found in the Proceedings. Further information on the Irish, Black, Jewish, Gyspsy, Homosexual and Huguenot communities and suggestions for search strategies can be found under Community Histories. For a more detailed demographic account see A Population History of London. If by 1760 the character of London's growth was set, with its aristocratic western squares and poorer East End communities, the later decades of the century both reinforced and added at least one new aspect to the pattern. By 1760 London had largely escaped the magnetic pull of the Thames and its meandering east-west course, and the city had begun to expand dramatically both north and south. In part a response to new bridges and roads, to the evolution of a new transport infrastructure, the once open fields between the old City and Islington to the north were gradually filled with new housing; and Southwark evolved from a simple waterside settlement to a more substantial, and in parts much wealthier, suburb. 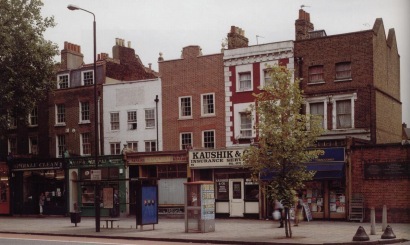 Snaking out along Borough High Road, the Great North Road and Whitechapel, new ribbons of development ate ever further into the surrounding countryside. It was in the decades at the end of the eighteenth century that the first London commuters can be found, sometimes taking advantage of the regularity and cheapness of the new Royal Mail coaches. The nature of the built environment that filled these once rural fields was both squalid and grandiose. Up until at least the passage of the London Building Act of 1774, and in many instances afterwards, many suburban developments were haphazard and of poor quality, the work of speculators -- poor carpenters and bricklayers, using even poorer materials. During periodic depressions in the building industry houses put up in hope of attracting middling sort and rich occupants were let out room by room to the very poor. House collapses were common, with whole families occasionally crushed in their beds. To the East and North of the City, the huddled suburban communities of London suffered poor housing and poor infrastructure, made tolerable only by the almost unbounded demand for casual labour on the quays and wharves and in the service industries of the city. In contrast, the West End was built to a higher standard. The new shops of the early eighteenth century were made ever more grand, frequently taking the form of purpose built palaces of consumption that pre-figured later nineteenth-century department stores. New squares and commercial developments attempted to emulate the early success of St James’s and Hanover Squares. The urban palaces of the aristocracy stood shoulder to shoulder around these formal squares, with chains, iron railings and padlocks increasingly serving to segregate the rich from their neighbours. At the same time the back streets and mews that filled the areas between the squares retained a diverse community of artisans, service workers and paupers. New types of street lighting, paving and water supply grew in the same pattern, with remarkably high standards to be found in the West End and in those parts of the City rebuilt after the Great Fire, and equally remarkably low standards in many other areas. While numbered houses, served by fresh running water, framing beautifully paved roads could be found in many areas, in others ground water from public wells was still the only source, and mud still filled the unimproved roads for much of the year. At the turn of the century, the building of the huge, enclosed docks east of the Tower only served to emphasise the relative squalor of the surrounding communities. Although the jurisdiction of the Old Bailey did not extend to Surrey, the pattern of urban growth north of the river is fully reflected in the Proceedings. Individual streets can be identified in trials and located on contemporary maps using Locating London's Past, while a measure of the city's prosperity is evident in the wealth of consumer goods found in the trials. In 1760 you could still find some wealthy individuals amongst the poor of the East End. But, by the early nineteenth century the city had become increasingly subdivided between rich and poor, with the middling sort dispersed somewhat more widely across the city. By 1815 a member of the gentry would no more consider leaving his West End haunts to walk to the East End than he would consider walking to the moon. The startling success of works such as Tom and Jerry, or Life in London a few years later in 1821 reflects this newly subdivided world. Tom, Jerry and Logic, the heroes of the piece, are like foreign tourists travelling through a strange, unknown land, returning to their familiar West End club at the end of each adventure. As a result different parts of the city gained their own distinctive social and occupational structures. The East End became the home of manufacturing, of brewing and distilling, sugar processing and textiles. In combination with the ever-hungry maw of the port, its industries consumed the lives of generations of workers. Besmirched by the smuts and odours sent skyward from the warm coal-fired hearths of the West End, East Enders struggled in poor conditions, at difficult jobs, in a poor environment. Periodic attempts to defend their jobs in the face of threats posed by labour-saving devices led to occasional violent protests, such as the attacks by the "cutters" on master silk-weavers' engine looms in 1769. In the ring of suburban parishes along the City's northern and western borders other groups of the poor similarly eked out a hard working life. In St Giles in the Fields and Farringdon Without, large families rented small rooms in badly built tenements, and made a living in the precarious service industries of the capital -- as porters and needle women, chairmen and street hawkers. In the City itself the financial services of insurance and merchant banking along with warehousing and trading came to form the basis of huge fortunes and middling sort aspirations. City merchants increasingly moved out to more salubrious spots beyond the ring of slums gradually encircling the metropolis, commuting back daily to Cheapside and the Royal Exchange. Witness to the greatest change, the West End evolved in response to the growing importance of the London Season, and its increasing role in the lives of Britain's elite. 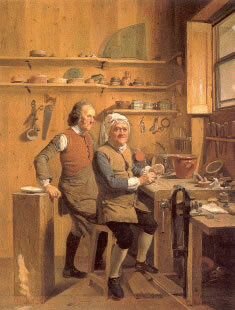 Here the palaces of the aristocracy were served by well-appointed shops and skilled craftsmen. Communities of service workers, coach makers, and dancing masters filled the interstices between the parks and squares, town houses and royal residences, servicing perhaps the wealthiest single community in Europe. You can search for particular occupations using both the personal details search page (for victim and defendant occupations) and keyword searching. Late eighteenth-century London dominated the culture of the English-speaking Atlantic, and increasingly the Pacific and Indian oceans as well. The vast majority of Britain's printing presses and newspapers were sited here. The city was possessed of a huge number of coffeehouses and theatres and was home to Britain's greatest authors and scientists, doctors and thinkers. Lectures, exhibitions and debates could be found on almost any day of the week. In intellectual terms it far outpaced the near moribund Universities of Oxford and Cambridge, while the existence of the Royal Society, the great hospitals, and a wealthy and leisured class ensured a vibrant and diverse world of ideas. The workings of this world were embedded in a complex set of institutions. Although the royal court played a decreasing role in patronising the arts, a popular audience for theatre and printed works grew up in the West End, centred on Covent Garden, and supplied with an ever changing diet of new events and publications by people such as Samuel Johnson and David Garrick. The great associational charities of the age, most of which had been founded around mid-century, such as the Foundling Hospital, the Magdalen, and the Marine Society, went on to form the locus for a shared, elite culture. And if England can be said to have had an "Enlightenment" it was to be found somewhere between Grub Street, White's coffeehouse, the Royal Academy and that quintessential eighteenth-century London institution, the British Museum (founded in 1753). But, if in these decades London went from strength to strength, dominating both Britain and its overseas empire, the politics of the capital became ever more parochial. The old City, which housed an ever dwindling proportion of London's population, was run by a still powerful, but increasingly isolated Common Council, Aldermen and Lord Mayor. It continued to act as an effective pressure group on national politics, but ceased to be able to reflect the political demands of the capital as a whole. The location of Parliament, mired as it was in the urban sprawl, ensured that national governments would be sensitive to the demands of London. But the growth of the metropolis meant that it could not speak with a single voice. Instead, the City, the Middlesex Bench and the over weaning parishes of Westminster each contributed their own tune to the cacophony of voices seeking to make London heard. The resulting rough music allowed fertile innovation, but it failed to curb the city's myriad social problems. On the street, in the alehouses and the low coffeehouses, politics took a different form. Against a backdrop of first the American and then the French Revolution, a new kind of popular politics grew to maturity. 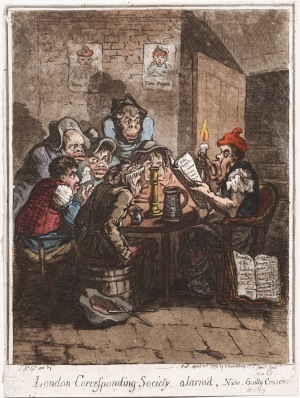 From the agitation associate with John Wilkes in the 1760s and 70s; in the Gordon Riots of June 1780, and both the Revolutionary and counter-Revolutionary politics of the 1790s and 1810s, Londoners found a new political voice. "Radical Westminster" with its uniquely open franchise provided one outlet for the political frustrations of Londoners, but the city’s century old traditions of riot and newer organisations such as the London Corresponding Society and its many successors provided others. The government’s response to this new politics, both the apparently reactionary Gordon Riots and the radical and progressive politics of the 1790s, can be located in numerous trials in the Proceedings by searching for crime type "riot". See also London, 1715-1760 and London, 1800-1913. Fox, Celina (ed. ), London – World City, 1800-1840 (1992). For more secondary literature on this subject see the Bibliography.